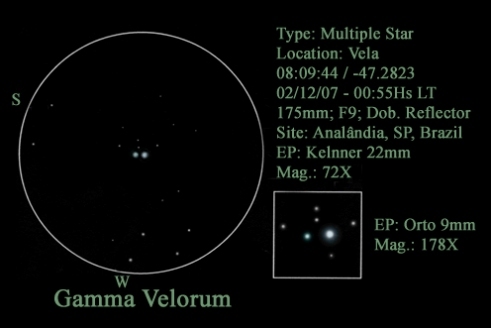 The brilliant Gamma Velorum system is composed of at least 6 stars. The primary star of this system is actually a spectroscopic binary that has been dubbed the Spectral Gem of the Southern Skies because its exotic spectrum is dominated by bright emission lines rather than dark absorption lines. It is composed of an O9 blue giant and a massive Wolf-Rayet star that are separated by 1 AU and orbit with a period of 78.5 days. The Wolf-Rayet star probably started its life at around 40 solar masses, but has blown most of that mass away and is now probably closer to 10 solar masses. Both stars in this pair have extremely powerful winds, and as these winds collide they produce X-Ray emissions. The Wolf-Rayet star is likely in the last stages of its path toward exploding as a Supernova. It’s companion will eventually follow suit. The B component seen in Rogerio’s sketch is a B-class subgiant and the C and D components (lined up above the A and B components in the sketch) are white A-class stars. The D component itself has a much fainter and challenging 13th magnitude companion separated from it by 1.8 arc seconds (the 6th star in the system). Rogerio sketched this beautiful multiple star using pencil on white paper. The sketch was then scanned, inverted to a positive image, and digital methods were used to enhance and add observed color to the stars. His sketch gallery can be found here: A vida, o universo e tudo o mais. Beautiful sketch of brilliant southern sky suns.